Love Dragon Ball, One Piece, or Naruto? Good news! A new attraction consisting of ALL THREE series will be opening this year in Ikebukuro’s Sunshine City! I actually took this photo a while ago (in March haha) but forgot about it until earlier when I was looking through my photos. I was super excited when I first saw the poster, so I have no idea how I forgot about it LOL. Out of the 3, I only closely follow Naruto, but I’m definitely looking forward to seeing the other areas too. There’s only, what? 597 episodes and counting. *nonchalant shrug* Easy peasy. 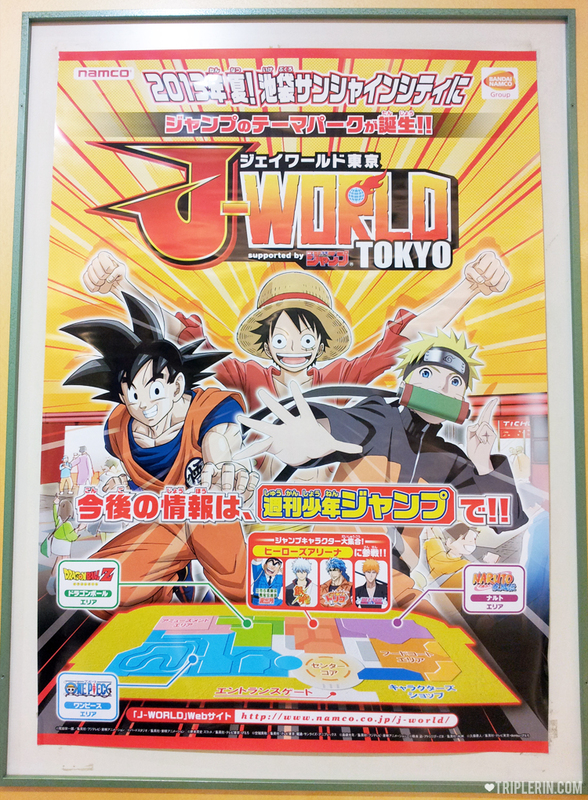 I see that there’s an area for other Jump series… and I spot BLEACH! I never really got over the heartbreak when I was unceremoniously dumped by the series when the anime ended without warning. But I’ll visit for old time’s sake. I’m gracious like that. The official website states that it is slated to open in 21 July 2013! Hmmm. 1.5 months to catch up with 600 episodes. To do or not to do. That’s the question. Haha.. highly recommend One Piece..is a good anime to watch. Some episodes made me feel positive and “dun give up”. I actually started watch One Piece, reeaaallly slowly. Still on single digit episodes haha! Do you watch Naruto? It makes me feel the same way!